Kidney stones ( renal colic or ureterolithiasis )The stones are solid concretions or calculi (crystal aggregations) formed in the kidneys from dissolved urinary minerals. Nephrolithiasis refers to the condition of having kidney stones. Urolithiasis refers to the condition of having calculi in the urinary tract (which also includes the kidneys), which may form or pass into the urinary bladder. 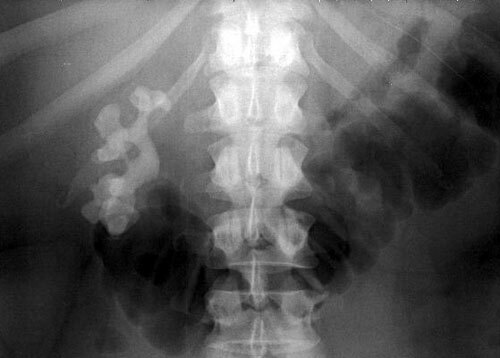 Ureterolithiasis is the condition of having a calculus in the ureter, the tube connecting the kidneys and the bladder. The term bladder stones usually applies to urolithiasis of the bladder in non-human animals such as dogs and cats. Colicky pain: "loin to groin". Often described as "the worst pain [...] ever experienced". This can also occur in the lower back. Nausea/vomiting: embryological link with intestine- stimulates the vomiting center. Pyuria: pus in the urine. Postrenal azotemia: the blockage of urine flow through a ureter. Hydronephrosis: the distension and dilation of the renal pelvis and calyces. Kidney stones can be due to underlying metabolic conditions, such as renal tubular acidosis Dent's disease,hyperparathyroidism, primary hyperoxaluria and medullary sponge kidney. Kidney stones are also more common in patients with Crohn's disease. Patients with recurrent kidney stones should be screened for these disorders. This is typically done with a 24 hour urine collection that is chemically analyzed for deficiencies and excesses that promote stone formation. Other types of kidney stones are composed of struvite (magnesium, ammonium and phosphate); calcium phosphate; and cystine. Drinking enough water to make 2 to 2.5 liters of urine per day. A diet low in protein, nitrogen and sodium intake. Restriction of oxalate-rich foods, such as chocolate, nuts, soybeans, rhubarb and spinach,plus maintenance of an adequate intake of dietary calcium. There is equivocal evidence that calcium supplements increase the risk of stone formation, though calcium citrate appears to carry the lowest, if any, risk. Taking drugs such as thiazides, potassium citrate, magnesium citrate and allopurinol, depending on the cause of stone formation. Some fruit juices, such as orange, blackcurrant, and cranberry, may be useful for lowering the risk factors for specific types of stones. Orange juice may help prevent calcium oxalate stone formation, black currant may help prevent uric acid stones, and cranberry may help with UTI-caused stones. Avoiding large doses of vitamin C.
For those patients interested in optimizing their kidney stone prevention options, a 24 hour urine test can be a useful diagnostic.